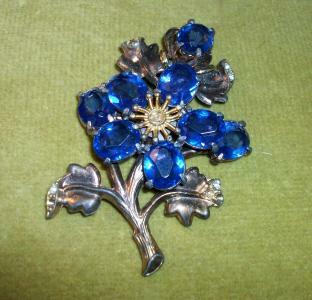 Vintage copper tone, clear and blue rhinestone floral pin. Measures almost 3" high and has 2 loops attached that I can remove if you'd like to enable it to be worn as a necklace. Missing small center stone & 2 smaller rhinestones. Top flower sits atop the other ones.